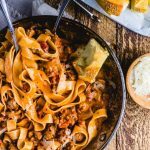 Are you in need of an easy chicken recipe that is almost foolproof? Baked chicken legs are extremely easy to prepare. The Cajun seasoning really kicks this chicken dish up a notch (hey, I love Emeril). And since the oven is already on, making this awesome Butternut Squash With Brown Sugar recipe completes an easy and healthy meal. Baked Chicken Legs Are Always A Hit! I have always loved the simplicity of baked chicken leg recipes. So versatile – any type of spice can be used. Feeling in a Greek mood – make a souvlaki marinade. 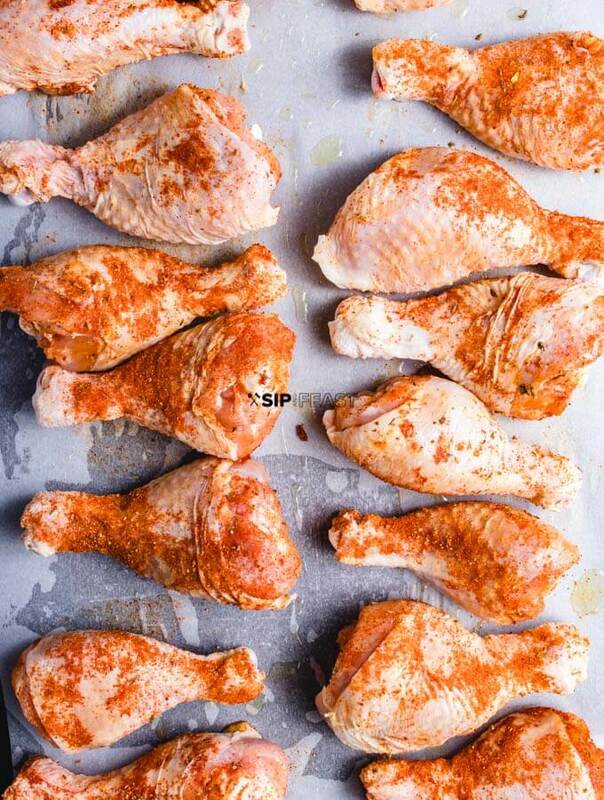 Barbecue – Do a nice rub all over the chicken legs and then coat with BBQ sauce at the end. Tandoori – Simply make a spice mixture or buy a commercial one and marinate in yogurt and the spices. Now I can go on about all the different ways to bake drumsticks, but I really love the simplicity of the Cajun seasoning. 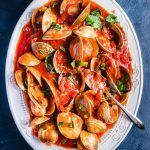 It packs great flavor and best of all, with a store bought mix, you are looking at 3 ingredients in this dish! But first let’s answer a few important questions when baking chicken legs. Try to get the drumsticks real dry. 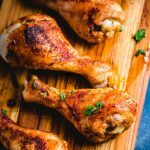 How Do I Make The Baked Chicken Legs Crispy? 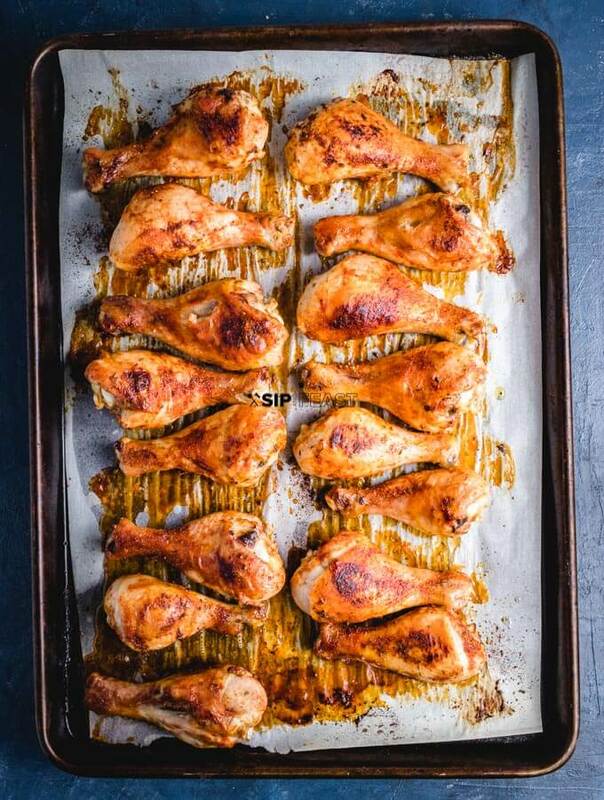 This can be accomplished by making sure the drumsticks are very dry before the baking process begins. Use paper towels to get as much moisture as possible off the chicken before adding the Cajun seasoning. Another trick to get the drumsticks crispy is to turn on the broiler for the last 2-3 minutes of cooking. The skin will crisp right up – just make sure that you are paying close attention because the chicken could get burned. At What Temperature Are The Baked Chicken Legs Done? Always cook chicken to 165 degrees. An instant read thermometer is your friend if you don’t have much experience cooking chicken. After you’ve been cooking for a while you will know every time when the chicken is done based on sight and touch. A chicken drumstick that is cooked through is firm to the touch, no longer exhibiting the softness of raw chicken. Juices of the chicken will run clear when it is done. Also the overall size of the chicken legs will shrink substantially. A chicken breast that is cut through will be completely white when done. 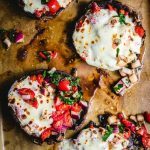 Not so on a leg – they can still have redness in it – so do not think red means uncooked. This is a surefire way to overcook drumsticks. 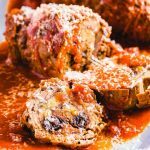 This article on How To Tell When A Roast Chicken Is Done, from Food and Wine has good info if you are still unsure. 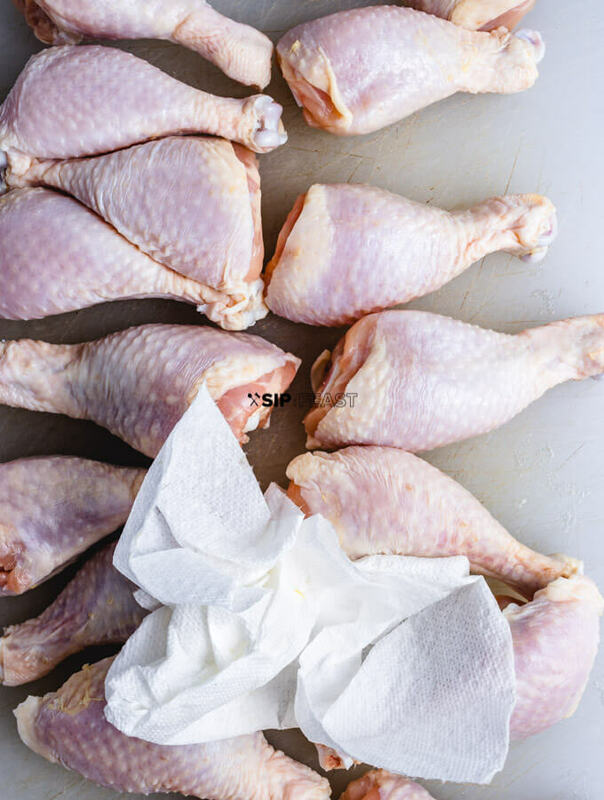 How Long To Bake Chicken Legs? As a general rule baked chicken leg recipes take around 40-45 minutes in a 400 degree oven – but never rely just on time alone. Your oven is different than mine which is why it’s important to go by the signs above or just whip out the instant read thermometer. 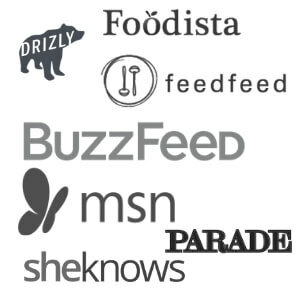 Feel no shame in that – I use an instant read all the time when barbecuing. It is a great piece of kitchen equipment. Yes! I was surprised to learn how healthy they are. 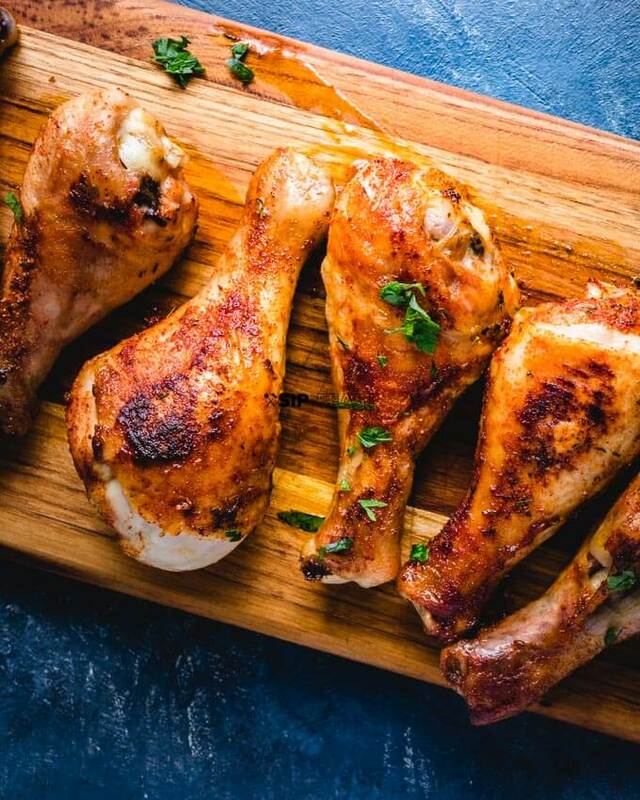 Livestrong gives a complete breakdown on the nutrition in chicken legs. The way they are cooked really is the determining factor. Obviously deep frying the drumsticks will be far less healthy than a dry rubbed drumstick. That added oil just really packs on the fat and calories. I got nothing against a good batch of fried chicken legs, but definitely go for these if calories are a concern. If you want to make these legs even healthier remove the skin – that’s not my thing but doing so will remove 30-40 calories per drumstick. 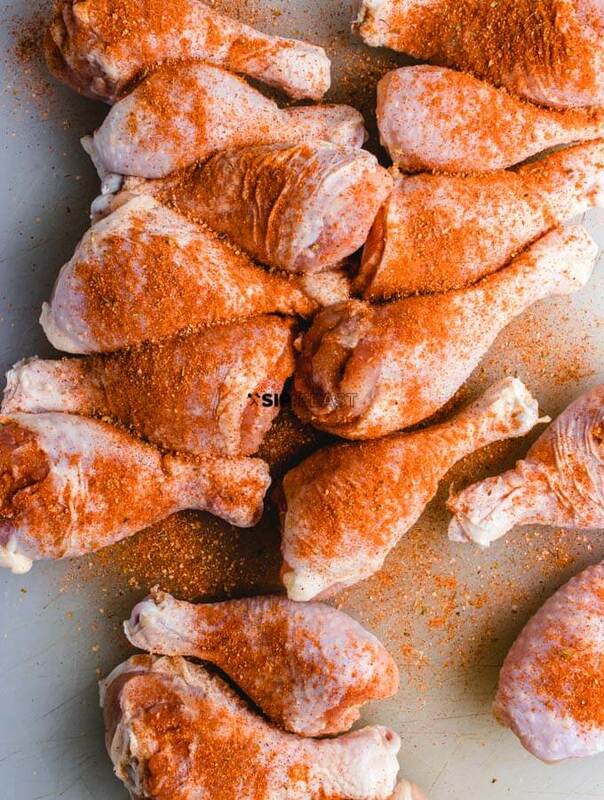 Cajun seasoning applied to the dry chicken legs. Just a tiny bit of oil on the parchment paper. Flip the legs at around 20 minute mark. The baked chicken legs are finished. So that’s all there is to it! 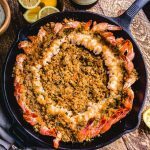 Hope you enjoy it, and by all means use your favorite spice mix if Cajun is not your thing. Honestly they are great with just salt and pepper. 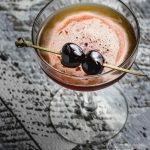 What about a drink pairing? Well since you asked I think a grapefruit mint margarita sounds absolutely perfect. 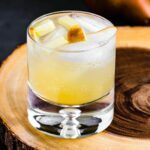 A close second would be a delicious Jalapeno margarita. Heat oven to 400f and place oven rack in middle. Dry off chicken really well with paper towels. Apply Cajun seasoning to chicken legs liberally. Line baking sheet with parchment paper and spread 1 Tbsp of olive oil on paper. Place chicken on parchment paper lined sheet. Spread evenly trying not to let chicken touch. 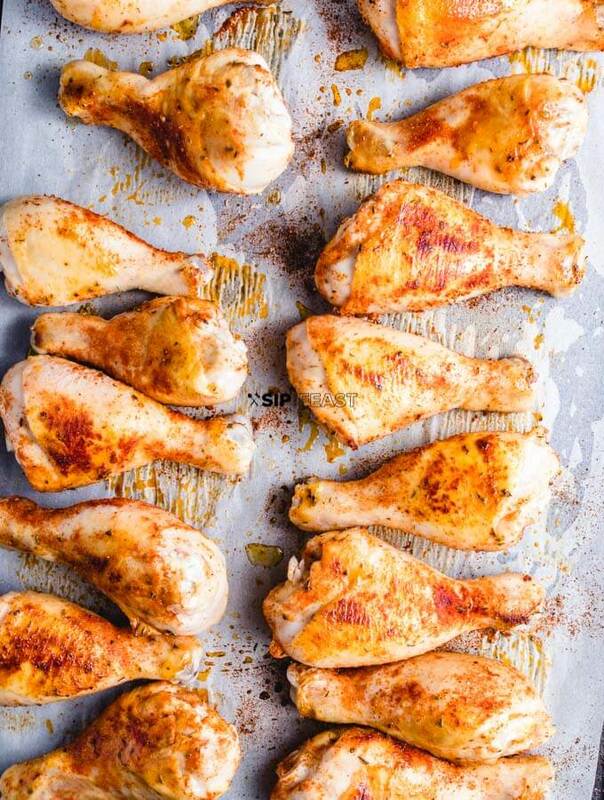 Bake chicken legs for 20 minutes and flip. Bake 20 minutes longer and test with instant read thermometer. Temp must be 165f. If not bake for 5 minutes more and check again. 2 Tbsp of Cajun seasoning is used, but definitely add more if you want. Coating the chicken legs completely is a good starting point. Cajun seasoning is salty so no extra salt is needed, but again adjust according to your own taste. Furthermore, if the Cajun spice doesn't have any salt (which is rare), salt the chicken liberally with kosher salt. 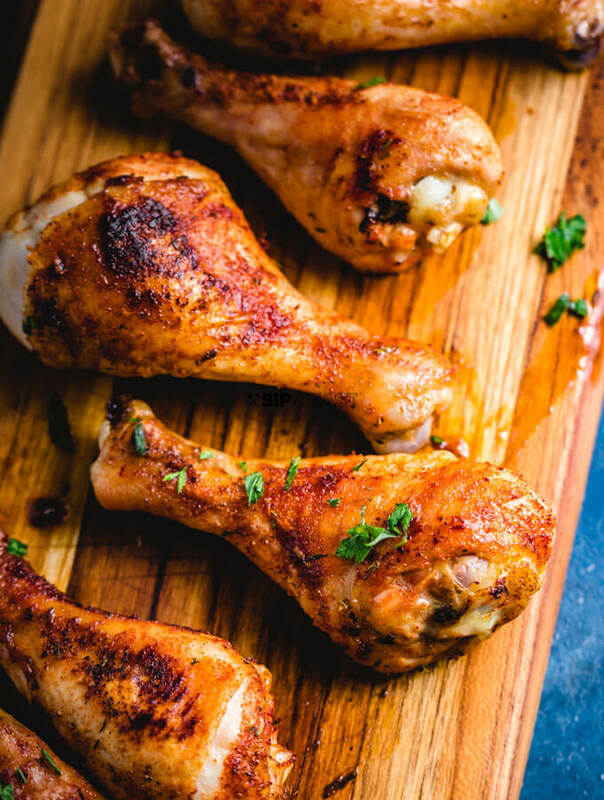 If you liked this recipe for baked chicken legs we would really appreciate it if you would share it on Instagram or Facebook using #sipandfeast. Thank you for sharing. We love the simplicity of this recipe.